*Disclaimer - I received the product in this post from Lionsgate, in order to facilitate this review for my readers. Are you looking for a new movie to watch? The views within the movie do not reflect my religious views. Based on The New York Times best-selling novel, written for the screen by John Fusco (The Forbidden Kingdom) and Andrew Lanham (The Glass Castle) & Destin Cretton (The Glass Castle), and directed by Stuart Hazeldine (Exam), The Shack takes us on a father’s transformative spiritual journey. After a family tragedy, Mack (Worthington) spirals into a crisis of faith and questions God’s existence and life’s purpose. Mack is unable to move on, until he gets a mysterious invitation to an abandoned shack. There, God reveals Himself in the form of three strangers led by Papa (Spencer). Mack’s journey will transform audiences of all ages, in this movie that you will want to watch over and over. The Shack home entertainment release will feature audio commentary with director Stuart Hazeldine, five featurettes, and a deleted scene. The featurettes include a look at the development of the book with author William Paul Young in “Touched by God: A Writer’s Journey”; a conversation with the filmmakers, cast and theologians to discuss the movie’s depiction of God in human form in “God’s Heart for Humanity”; the music video for the song “Heaven Knows” by Hillsong United, the in-depth “Something Bigger than Ourselves: The Making of The Shack” featurette and a look behind the scenes of the premiere in “Premiere Night: A Blessed Evening”. 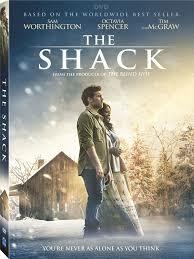 The Shack Blu-ray and DVD will be available for the suggested retail price of $39.99 and $29.95, respectively.